Samaria Jewish leadership travels to Europe to appeal to the EU against anti-Israel boycott, EU funding for far-left groups. 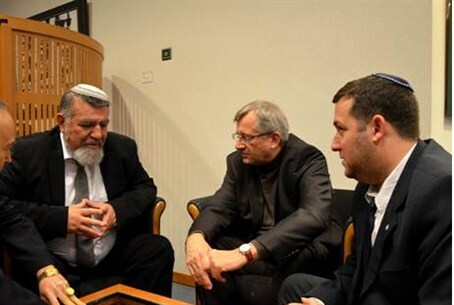 Israeli leaders from Samaria (Shomron), led by Samaria Regional Council head Gershon Mesika, decided to address their differences with the European Union by traveling to Brussels and speaking with EU parliamentarians face to face. They came equipped with maps and data on Israeli communities in Judea and Samaria, including figures on employment of Arabs in those communities. They sought to explain why an EU boycott of goods produced in Israeli communities in Judea and Samaria is a bad idea, and why the EU’s funding for far-left organizations in Israel is not helping their cause. They found that many EU parliamentarians were receptive to what they had to say. Parliamentarians were particularly receptive to the idea of reexamining the EU’s donations to Palestinian Authority and Israeli groups. They said they would work to ensure that in the future, all donations are considered carefully to ensure they will be used for a practical benefit. Some of the EU MPs had participated in tours of Samaria’s Israeli communities in the past. The Israeli delegation invited others to come see the region with their own eyes as well.